How is an All-on-4™ operation carried out? We find many “low cost” offers on the market. Are they trustworthy? What influence do the materials used in a system like this have? In brief, what benefits can All-on-4™ system offer? How do I know if the All-on-4™ system is suitable for my problem? 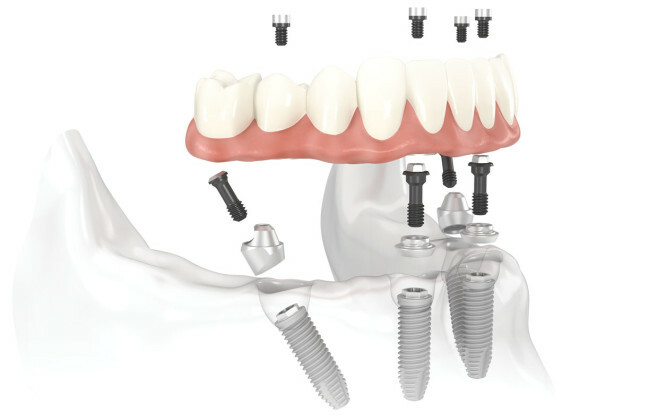 All-on-4™, which means “all on 4” (implants), is a protocol of prosthetic implant that provides edentulous patients (toothless or about to lose their teeth) or patients with serious bone and / or teeth problems, a fixed, highly efficient, scientifically validated and aesthetically highly predictable prothesis, supported by only 4 implants that allow rehabilitation of the complete arch by means of immediate loading in only one day. Our Studio is the Nobel Biocare, All-on-4™ Centre of Excellence and worked for years with Malo Clinic, Lisbon and with its founder, Prof. P. Malo, creator of the All-on-4™ system. In addition, Dr. Benzi is the lecturer on this official Nobel Biocare System course. Who is All-on-4 aimed at ™ ? It is aimed at patients suffering from complete edentulia (toothlessness on one or both arches) or exhausted dentures which need replacing, even in cases of bad or very serious atrophy or demolition of the maxillary bone structure. The All-on-4™ system and protocol were designed and developed by Dr. Paulo Malo, owner of the Malo Clinic Lisbon, of which our Studio is the Italian Partner, along with that of Dr. E. Agliardi. This system undoubtedly represents a work of art in the field of rehabilitation of jaw s which are more or less atrophic. In fact, with its variants it offers an opportunity for all patients, even those with the most serious maxillary atrophies, to recover a valid and complete, fixed masticatory function in a single day, as well as global morphological and aesthetics recovery of face and smile. How is an implant carried out?